Would you recommend Facebook Messenger to a friend? Facebook Messenger is rich and feature-packed. Plus, everyone is on Facebook. They could make a native Facebook Messenger app for computers, maybe. Like how Telegram does. Demm Rel has used this product for one year. @rrhoover Ryan how did you get this screenshot? I am not seeing where I can sign up for Facebook for the web yet. @rrhoover @cattrestini Same! What gives? @rrhoover @rubencodes @cattrestini This seems to be connected to the browser's language default. Messenger currently only works if your browser language is set to English. @rrhoover @rubencodes @davidbauer Yep also it was down for a little yesterday but it's back up now, so my problem is fixed on my end. Hope it's working for you too now, Ruben. Combine this with Fluid (http://www.producthunt.com/l/d63...) and you got yourself a pretty nice Mac app. @gregbarbosa Haha, we really were thinking alike! @gregbarbosa this is actually pretty sweet! @gregbarbosa @msch This is something I just realized. Mainly the fact that they can't enable the Desktop Notifications from within Settings. 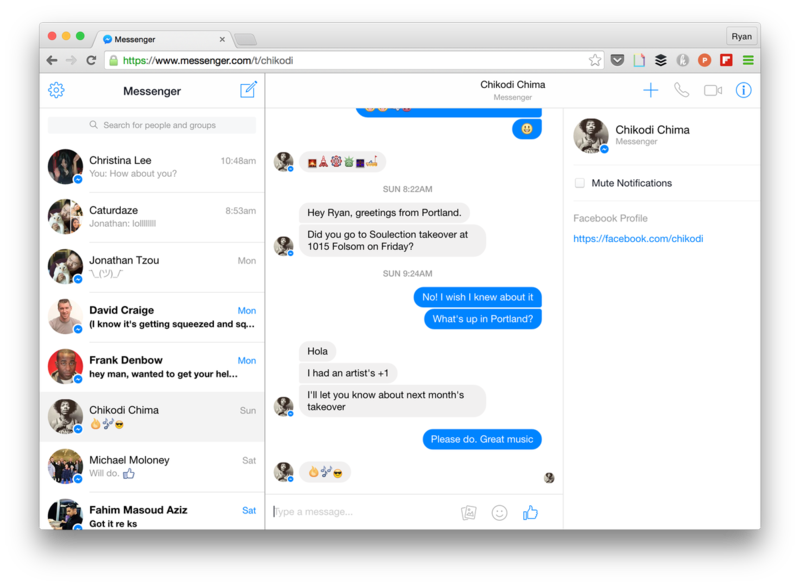 @andreasklinger This is Facebook going deeper on making Messenger a true platform. Line and WeChat are existential threats, and Facebook needs to get ahead of them in the west. @andreasklinger The other one that's huge and not a lot of people are talking about is spinning groups off into its own app as well: http://www.producthunt.com/posts... Then they slapped a 'sell' button on that too. This is a space I'm super interested in, to the extent I've started to prototype ecommerce tools targetting these platforms. @andreasklinger I've been following the behaviour of popular selling groups for the past year and can see a trend in individuals doing there best to bypass "extortionate" fees such as ebays. Facebook could do some real damage to eBay with the right strategy. I'm looking forwards to seeing what you build Anton!